The first Firefox add-on to optimize SQLite databases that are used to store data like bookmarks or history was a Russian add-on that worked but did not please non-Russian speaking users because of its lack of translation. Vacuum Places Improved is a relative new add-on that is available as an English version and features additional options that make it a recommended add-on for users who want to optimize their Firefox database. The reason for optimizing the databases used by the browser is that it may result in faster startup and response times when they are queried. The Firefox add-on offers two options to optimize SQLite databases used by the browser. The first option reminds you in regular intervals (based on browser starts) that it is time to optimize the browser's SQlite databases. This is done by displaying an icon in the browser that indicates this to the user. The second option, which is probably more comfortable to most users, is to clean the SQLite database automatically after a certain number of browser starts. This automates the process fully so that you don't have to do anything anymore. The start values for both options are listed in the add-on's preferences so that you can change them there. 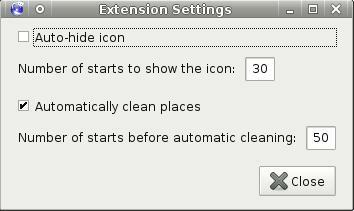 The default values are to show the icon after 30 starts and clean up the databases automatically after 50 starts. Vacuum Places Improved is compatible with Firefox 3.5 and later and can be downloaded from the official Mozilla Firefox website. Update: The extension is still fully compatible with recent versions of Firefox. If you want more control, you may want to check out Places Maintenance instead. The extension lets you choose from several cleaning options and provides information about the cleaning process as well so that you know how much space it reduced the database by. Firefox vacuums databases automatically now as well which makes these extensions more or less redundant (they may still provide more options though). With your first story Martin, a few days ago, about this add-on i installed version 1 later i found out ( not on Ghacks) that version 2 was out, so i installed it. I think its (ferry) strange that main (more than once daily) updates check did not find out that there was a newer ( version 2 and version 3) version. Does this version 3 now has the possibility to be found for updates, so when version 4 comes out there will be a automatic update? This is a joke, these tricks exists for years, they do NO-THING. Firefox does this automatically now, no need for 3rd party extensions.